“Hard Luck Woman” is a bit of a letdown after three consistently solid weeks of Cowboy Bebop episodes. It’s a response to “Speak Like A Child,” the episode where Faye discovers a video cassette shot by her younger, pre-amnesiac self. Unfortunately, there isn’t a sense of urgency to the two competing plotlines in “Hard Luck Woman.” Neither Faye’s search for a water fountain filmed in her memento mori tape nor Ed’s quest to reunite with her father is motivated by pressing, immediate concerns. There’s consequently no tension to these stories beyond the fact that they sate viewers’ innate curiosity about where Ed and Faye come from. 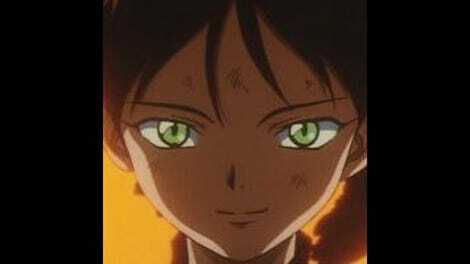 But to be more specific: A good part of my frustration with “Hard Luck Woman” stems from how exasperating Ed’s search for her father eventually becomes. It’s a one-note joke that gets tiresome after a while. So while I do appreciate that the show’s writers dedicated an episode to Faye’s sudden decision to find out more about her past, the details given to us in “Hard Luck Woman” really do need a strong back-up story to ground that search. Ed’s own search is grating after a point because it’s not only just as listless as Faye’s personal quest—it’s also an unwelcome reminder of how a supporting character like Ed can very quickly wear out her welcome. First, allow me to say: I like Ed. In fact, Ed is my second favorite member of the Bebop crew. What I don’t like is the way that “Hard Luck Woman” overextends the character’s natural charms. If Ed is used properly in an episode, she can be funny. By which I mean: I think she works best as a supporting character rather than a protagonist that pushes the plot forward in a significant way. (She’s usually a walking McGuffin.) This isn’t just a matter of how much screentime Ed gets in any given episode, but that’s a major part of it. Ed is funny because she’s constantly interrupting other people and she speaks in nonsense rhymes that nobody is capable of decoding in most contexts. 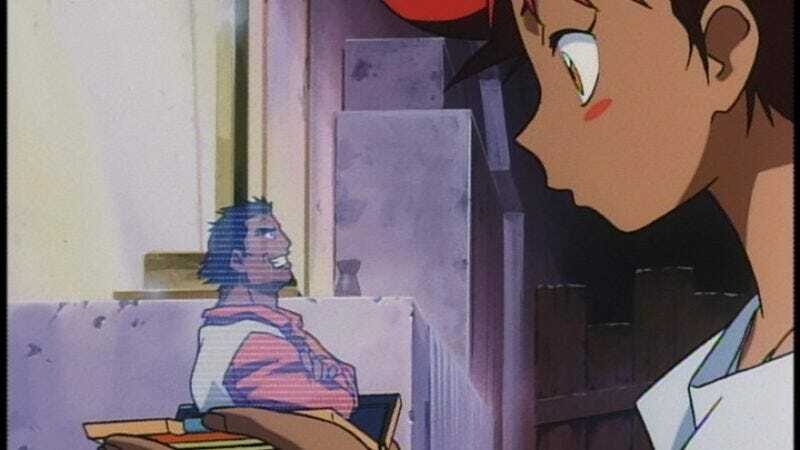 So while I also appreciate that “Hard Luck Woman” doesn’t tell us too much about Ed’s life before the Bebop, what bothers me about her story in this week’s episode is just how overexposed she seems by the end. Ed’s defined by her quirks so being around her for longer than usual does her a disservice. This week’s episode begins after Faye enlists Ed to help her find the fountain in her videotape. This takes them to Earth, where Ed drags Faye to the orphanage of her youth. We learn that this is where Ed grew up after a group of children pop out of nowhere and scream spastically; one of them asks Faye for her fingernails: “I’m collecting them. Just the pinky one will do!” Soon after this initial encounter, Sister Clara, the nun in charge of the orphanage, gives Ed a holographic picture of Ed’s father. We instantly know that this is Ed’s father because he’s got a wacky, demented grin on his face. Not only that, but soon after Ed’s father is identified in this holo-portrait, we learn that his name is Appledelhi Siniz Hesap Lutfen. Yup, definitely Ed’s dad. It should be noted that Appledelhi and Ed’s subplot isn’t actively bad, just irritating. For instance, Spike and Jet’s search for Appledelhi—their first big bounty a while, according to Jet—didn’t really leave a lasting impression. When Spike catches up with Appledelhi, he’s confused but he’s not really exhausted. Which is key if I’m to believe that Spike and Jet’s independent search for Appledelhi (they don’t know he’s Ed’s father) is motivated by desperation, as their bounties usually are. Appledelhi is a much-needed meal ticket, so why aren’t they more desperate and/or eager to apprehend him before they learn he’s Ed’s dad? Also, I confess that I found Ed and Appledelhi’s reunion to be funny but a little too cute. Their reunion is where Ed’s schtick started to bug me. Ed’s an easily distracted savant that seems to have descended from the heavens for the express purpose of confusing everyone around her. Hearing daughter and father respectively say things like, “This is father-person” and “Francoise!” puts a noticeable strain on the show’s usually considerate use of Ed. These lines overburden their reunion with quirk. And that’s a shame because this is a fairly delicate moment, one where we see that even this androgynous-looking alien kid is someone’s daughter. By contrast, Faye’s subplot is just an enticing setup for future developments. She continues her search for the fountain and eventually starts to remember where she came from. The flashbacks that overwhelm her, composed entirely of jagged, singular images that don’t cohere into a cogent narrative, are beautiful and mysterious. Faye’s story isn’t preferable to Ed’s strictly because it says as much about Faye as Ed’s story does about her but in less time and in a relatively more seductive way. But that’s part of it. Still, Faye’s flashbacks are dynamic and beguiling. They remind me of Spike’s flashbacks from way back in “Ballad Of Fallen Angels.” One of Faye’s flashbacks, the one where she sees the sun glistening through palm fronds and the only sound that we can hear is our heroine’s ragged breathing, the wind and a nearby bird, is particularly dazzling. It gave me exactly the amount of information this story requires and it does it in an artful and intriguing sequence. But without a sturdier B-plot to ground “Hard Luck Woman,” Faye’s story just seems skimpy when in fact it’s the episode’s focus. That having been said, “Hard Luck Woman” is also intermittently funny. The running gag where Appledelhi can’t get straight the name of his partner, Macintire, made me laugh several times. And it’s just as much of a schitcky routine as Ed’s quirky dialogue is! It’d be disingenuous of me to say that there’s no way that Ed can never successfully be a character who advacnes the plot of a Bebop episode (for instance, I love “Jamming With Edward!”). Her schtick can and almost always does work, even if it generally doesn’t hold up when leaned on too hard.